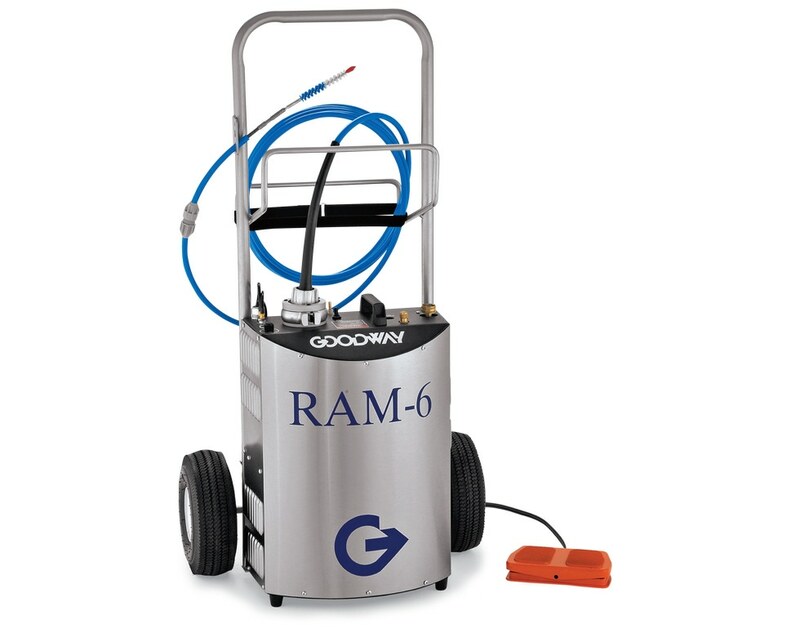 The RAM-6 Tube Cleaner is the ultimate rotary tube cleaning machine. When used with a "Patriot" Dual Diameter Brush, the advanced features of this machine allow it to thoroughly clean even the most fouled internally enhanced tubes. This versatile unit features a full 1-1/2 HP (1.1 kW), variable speed drive motor, a cleaning solution injection system and a separate 500 PSI (35 BAR) pump that delivers a 2.2 GPM (8.3 LPM) power flush. 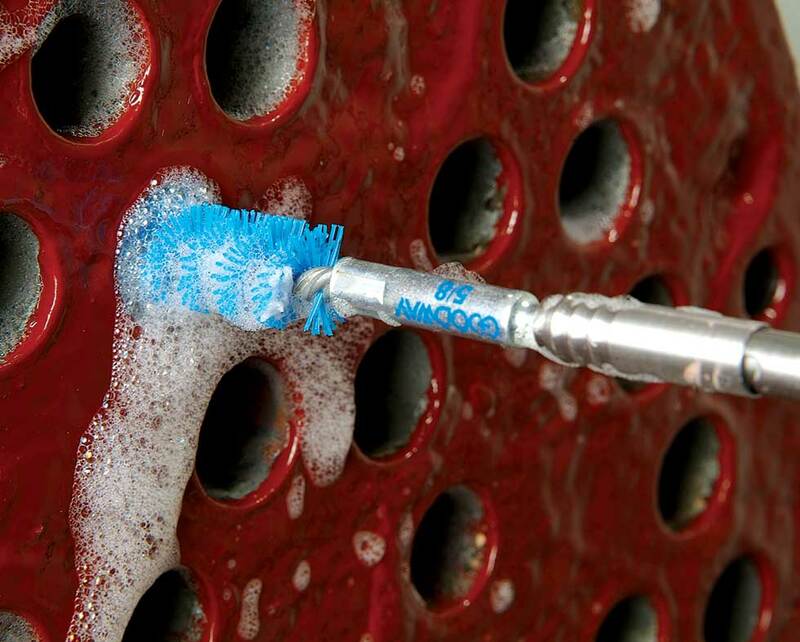 When cleaning internally enhanced tubes, the operator can adjust the shaft speed to match the internal spiral of the tube, causing the brush to be "self" propelled through the tube. It is ideal for removing both, soft and hard deposits, from internally enhanced as well as smooth bore tubes/pipes 1/4"-1" (6.4-25.4mm) I.D. The RAM-6 uses a cleaning tool mounted to the tip of a flexible shaft. The unit feeds high pressure water through the casing to the cleaning tool, power flushing out deposits as they are loosened. When the cleaning solution injection system is activated, the unit automatically feeds a mixture of cleaning solution and water through the casing to the cleaning tool as the shaft is fed into the tube. When the shaft direction is reversed, the unit switches to a water only power flush, leaving the tubes thoroughly cleaned. RAM-6 Tube Cleaner, contractor dolly, tool storage box and foot switch. Note: Shaft, brushes and other accessories sold separately. Drop the heads on a chiller in the winter and you’ll find slime, sludge and scale – maybe tubes that are packed solid with deposits. 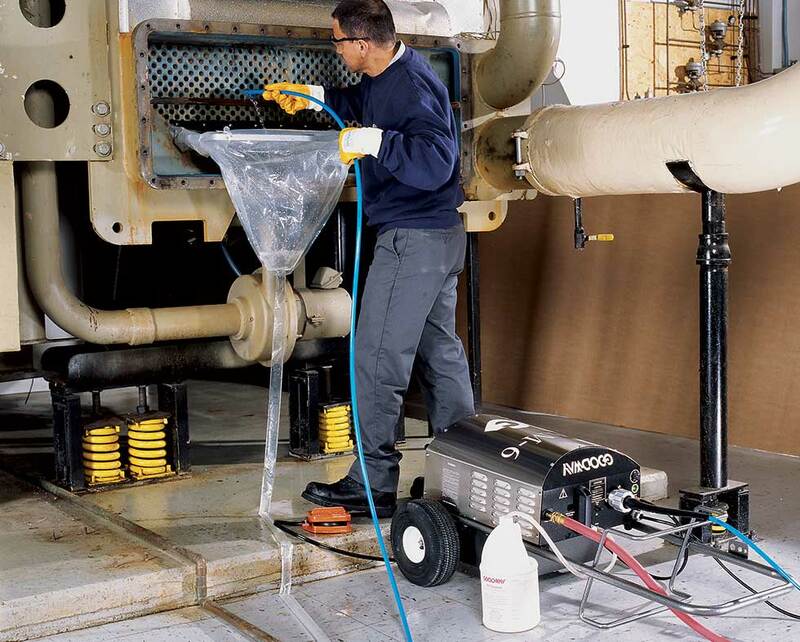 When you have thousands of tubes to service, your cleaning method matters. Find out how to best clean your chiller tubes.